Photo: Rainforest Action Network. Creative Commons BY-NC (cropped). As the world’s third-largest democracy heads to the polls next week to elect a new president, environmental activists remain sceptical of the candidates’ commitment to tackle climate change. Over four televised debates, Indonesia’s presidential contenders — Joko ‘Jokowi’ Widodo, Jakarta’s current governor, and Prabowo Subianto, a former general — have so far discussed their plans to shape the economy, boost international affairs, manage human capital and ensure clean governance. The environment is one of the last topics to be addressed in the final debate this Saturday ahead of the crucial Jul. 9 presidential election. “I think because they [the candidates] don’t see Indonesia as a developed country, reducing emissions [is] not a priority for them,” explained Yuyun Indradi, a forest campaigner for Greenpeace Southeast Asia-Indonesia, adding that a strong statement addressing environmental issues from either candidate could possibly convince swing voters. He believes the issue of emissions reductions contradicts both candidates’ stated focus on economic growth as a priority for the next government. But Farhan Helmy, manager of the Indonesia Climate Change Center (ICCC), does not see the issues as mutually exclusive. In an interview with IPS, he asserted that a green economy should be a platform for any party wishing to promote quality economic growth. In 2009, Indonesia’s outgoing President Susilo Bambang Yudhoyono pledged to reduce greenhouse emissions in the archipelago by 26 percent by 2020 — the equivalent of up to 767 million tons of carbon dioxide. And last year, Yudhoyono extended a 2011 moratorium, which barred new logging and palm-oil plantation permits under a one-billion-dollar deal with Norway. This moratorium, according to Bustar Maitar, head of the Indonesian forest campaign at Greenpeace International, will be the incoming government’s first real test. It remains to be seen whether the new government will proceed with “business as usual, or move forward to give total protection to the forests,” he told IPS, insisting that protecting Indonesia’s forests is key to reducing greenhouse gas emissions. “We must remember that decreasing emissions was a promise [made by] the current government, so whoever becomes president must respect the policy and follow through with it,” he added. Designed to address Indonesia’s dubious title as the world’s third largest emitter of greenhouse gases, after the United States and China, the Norwegian deal made its funding conditional on Indonesia adopting the United nations-backed Reducing Emissions from Deforestation and Forest Degradation (REDD+) scheme. So far, the country’s track record is poor. According to a study published this past Sunday in the journal Nature Climate Change, Indonesia has outstripped Brazil to become the country with the world’s highest rate of deforestation, even though its rainforests amount to only a quarter of Brazil’s Amazon. Conflicting data for the past decade suggests that Indonesia lost roughly 310,00 hectares of forest a year between 2000 and 2005, a number that increased to 690,000 hectares per annum between 2006 and 2010. “We must remember that decreasing emissions was a promise [made by] the current government, so whoever becomes president must respect the policy and follow through with it,” said Bustar Maitar, head of the Indonesian forest campaign at Greenpeace International. But researchers say that a million more hectares may have been cleared in the last 12 years than official statistics imply. According to Belinda Arunarwati Margono, one of the paper’s lead authors, Indonesia likely lost 840,000 hectares of its primary forest in 2012, putting it far ahead of Brazil, which felled about 460,000 hectares that same year. In light of this, the new government has its work cut out for it. According to Norway’s ambassador to Indonesia, Stig Traavik, 95 percent of the three-phase billion-dollar deal will be available to the incoming government, should it choose to prioritise the issue. Currently, Indonesia is home to the world’s third largest stretch of tropical rainforest, after Brazil’s Amazon and the Congo. Traavik said that while he has been happy with Indonesia’s progress to date, he would have “loved to see things move faster”. “We changed our government last October and one of the first things that was said was that our commitment to cooperate with Indonesia stands. And we hope and expect that the incoming government here will do the same thing,” he concluded. Taking the necessary steps to curb deforestation, however, will not be easy. Zenzi Suhadi, a campaigner with the Indonesian Forum for the Environment (WALHI), told IPS that the incoming government will need to do two things: stop the expansion of palm-oil plantations and mining, and conduct ecological restoration of forest areas as a crucial step in reviewing and changing permits for palm oil plantations. 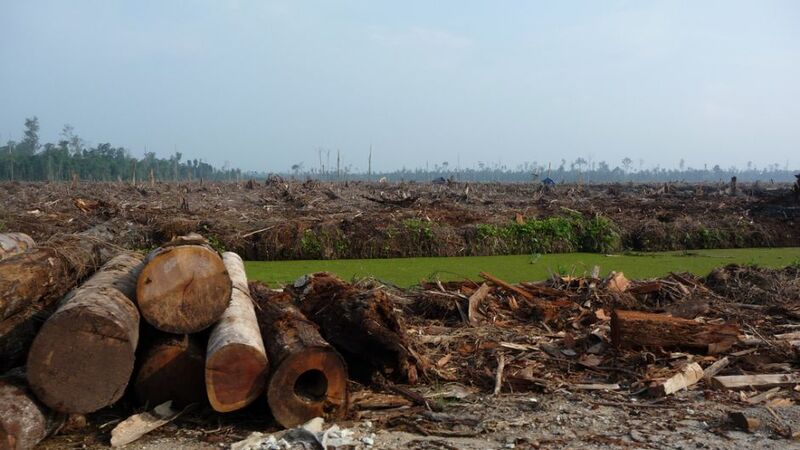 WALHI data through 2012 showed that a full 56 million hectares of forest had been damaged by just four sectors — logging, tree plantation, mining and palm oil. “An environment policy is important to address as it will affect many voters, especially those who have been victims of ecological disasters,” Suhadi told IPS. Suhadi said that the “fundamental issues would be resolved” when the next government addresses five points: managing people’s lands rights, enforcing environment and forestry laws, the resulting loss of the country’s gross domestic product (GDP), the loss of valuable biodiversity at multiple levels and the risk of environmental degradation. This week, a green campaign aimed at boosting conversation among the key stakeholders across four issues — climate change, forestry, energy and cities — was launched by ICCC, Matsushita Gobel Foundation and Indonesia’s Council on Climate Change (DNPI). Helmy, ICCC’s manager, told IPS that the initiative, “Presiden4Green”, will include public surveys across 10 cities to find out what kind of commitment the public wants from the candidates regarding environmental issues. “We would like this campaign to go even beyond the presidential election,” explained Helmy, adding that it could run until January 2015. Sandra Siagian reports for Inter Press Service, an independent news agency covering issues such as development, environment, human rights and civil society. The IPS network includes 370 journalists in 330 locations in over 130 countries worldwide.